Hello, beautiful people! It's a new year and a new beginning. A new chance to shine and sparkle. As for me personally, I am aiming to make 2014 a million times better than 2013 both in my personal life and for Bows and Curtseys! I have a lot of exciting things coming up for my blog that I think you all are really going to enjoy. I have a few video tutorials planned as well that will be filmed with my new DSLR camera. As a matter of fact, this look was taken using my new camera and I love the turnout. I'm still learning how to use it properly and I'm still playing around with some settings, so if you have any DSLR photographing tips, please let me know! Anyway, I created this look on a whim without any real idea of what I was going for. It started with just the glitter liner, and then I added everything else later. I'm quite pleased with the end result! It's warm, sparkly, and versatile. I think most people can pull this look off. This would look gorgeous with a purple or blue waterline as well! 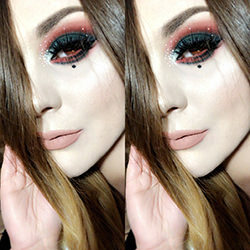 I didn't want to wear falsies with this because I felt that that they would distract from the glitter and it would be harder to photograph as well (my fellow beauty bloggers know the pain of photographing glitter, am I right?!). I hope you guys had a fantastic weekend and that you enjoyed this look! Like I mentioned previously, I am planning on filming some tutorials soon. Are there any specific looks you'd like to see? I know my Captivating Cranberry look is really popular and I get loads of requests on it, so that one is a given. I'd love to hear your thoughts. Wow, I love it! This looks gorgeous! Oh my goodness, your looks are always so gorgeous! I love this. Gorgeous, warm, flattering look! And the quality is just fabulous, I can see the difference already. Beautiful make over. The eyes so gorgeous.